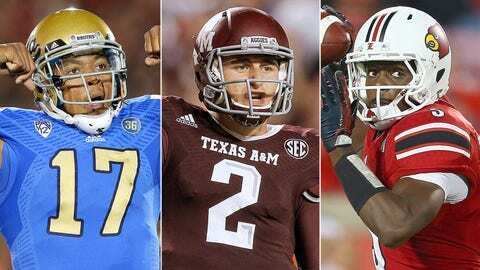 Way too soon to do an NFL mock draft, you say? Well, certainly it’s about three months too early to pull one off with any ounce of confidence. After all, last year at this time, I had Matt Barkley going in the Top 10 and didn’t have Travis Frederick anywhere close to sniffing the first or second round. But I also had EJ Manuel going in the first round and was hit with a barrage of emails calling me things so terrible, ‘idiot’ was a compliment. Well, I am, but I also follow this stuff pretty closely. Things happen. Coaches get fired. Free agency starts. Prospects run the combine / pro day / front-office interview gauntlet. Drug tests are taken — and failed. Those factors will combine to shake up the first round a hundred times over between now and May. So, why bother? 1. All draft-eligible players are eligible to be included in my mock draft, excluding players who have said they are returning to school next season, like Oregon QB Marcus Mariota has declared he’s coming back to school. 1. The draft order used here is based on the current standings with teams’ projected final strengths of schedule as tiebreakers. The final 12 picks will be determined by playoff finish. So many questions down there in Houston right now. Do the Texans stick with Gary Kubiak? Is Case Keenum the answer at QB, or does Matt Schaub get another shot? We will know by May, but as of right now, I think a quarterback’s the way to go. For what it’s worth, Mariota was my No. 1 QB prospect this year. But he proved to be one of a very rare breed: somebody who picks Eugene, Ore., over Radio City. The Texans have QB issues. 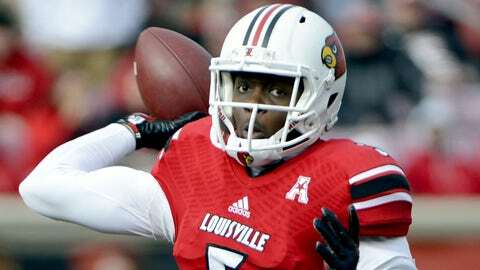 Could Teddy Bridgewater be the answer? Hundley told Jim Rome this week he’s likely returning to Westwood next season, but let’s pencil him in here for now. This is a lot earlier than where most others have him, but I think he’s got all the tools. Jags would be drafting on potential, which I think they’re OK with. He’s got the biggest upside of the entire QB crop this year. At 6-foot-3, 220 pounds, he’s got the build and the spark to be a talented pro quarterback. Jacksonville’s been patient with Blaine Gabbert; that patience has finally run out. Matthews is the franchise offensive tackle Jason Smith was not (for those who forget, Smith was taken second overall out of Baylor in the 2009 Draft — he started 26 games in three seasons in St. Louis, then played two games with the Jets and is now out of the league). With the 14th pick in their back pocket, the Rams have the luxury to take the best guy on the board at No. 3 instead of the third-best quarterback. I think Matthews is the guy. Is Mike Glennon the guy at quarterback? I think so. Of course, a lot can change with four weeks left in the season. Anthony Barr could be the guy here, but Watkins and Vincent Jackson could form one of the top receiving duos in the NFL. Watkins has all the tools to be an NFL great. He does it all. Think Von Miller, Part II. Dropping to No. 7 is a bit of a surprise, but Oakland wouldn’t blink. A top-10 pick out of Buffalo? Yes. And he fits D-coordinator Ray Horton’s scheme perfectly. Quarterback may be tempting here, but remember, Cleveland has a pick at the end of the first round, too. The Browns can be creative here. Proven run-stuffer. Another addition to a rebuilding defense that can play right from the get-go. Tough, hard-nosed player who can play right away. Played very well versus Ohio State. Looks like a future Steelers road paver. Big Ben could sure use him. 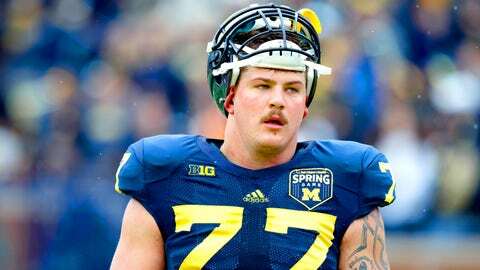 Big, bruising Michigan offensive lineman Taylor Lewan could be an ideal fit in Pittsburgh. The Jets have decisions to make all over the field, starting at quarterback. I know, I know . . . Geno Smith is already there. Well, Smith came into this season very much unproven, and with a month left in the regular season, the best we can say is he still looks unproven. Is Johnny Football capable of handling the spotlight of New York City? He sure played awfully well with all eyes on him this season. He’s a hot-button topic, so why not be a New York Jet? And unlike many others, I do think his skill set translates to the pro game. Sure, he has got a lot of room for improvement. But they all do. 14. St. Louis Rams — Note: I originally had the Rams taking LSU QB Zach Mettenberger with this pick. But with reports surfacing Tuesday night the Mettenberger suffered a torn ACL, the pick has changed. 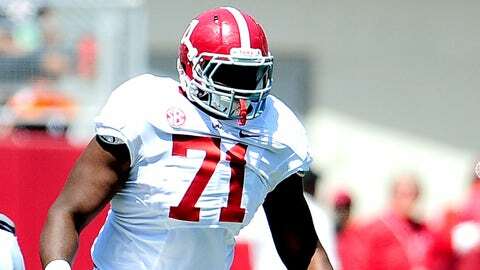 The Ravens need an upgrade on the offensive line, and Alabama’s Cyrus Kouandjio has the look of a potential star. The Cardinals lost 2013 No. 7 overall pick Jonathan Cooper to an injury before this season started. He’ll be the anchor of the offensive line’s interior. Ogbuehi would make for an awfully nice addition at one of the tackle spots. Is there a better fit in the first round? He’s a 315-pound mauling guard; the 49ers love to pound the ball up the middle. He was recruited by Jim Harbaugh in high school; now he plays for him in the pros. Dontari Poe has been a sensation in the middle during his second season with Kansas City. D-coordinator Bob Sutton grabs another one in Will. By the way, Will is not related to Bob, but Will’s dad Mickey played DB and returned punts in the NFL for five seasons. 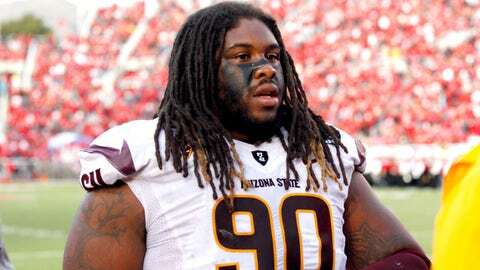 An already formidable Kansas City Chiefs defense could get another spark with Arizona State’s Will Sutton. Breslin has battled injuries this season, but has been a beast when healthy and was on pace to do special things this season. Broncos D-coordinator Jack Del Rio, who I assume will be back next season, is an old USC linebacker, himself. A small school guy you haven’t heard of. Scouts like him — 6-2, 205 pounds, and all over the field making plays.